“It’s Time” (joint project with Olga Kisseleva) revolves about the perception of time and the phantasy of every modern citizen to control its flow. When the visitor enters the room, she lays her hand on a tablet equipped with a biometric sensor that measures her degree of stress and anxiety. In front of her there is a huge clock-radio that displays the current time but time will flow more or less rapidly depending on the information gathered by the sensor. When the visitor is stressed and frenzy, time slightly accelerate by a couple of seconds, whereas a visitor in a relaxed state will infer a slightly slower time pace for twenty seconds or so (time can even stop for a short while for very chilled-out visitors). This is made such that a cool visitor will be given more time to experience its blissful state, while a frantic visitor will experience a growing frustration. It’s Time LichtRouten festival, Germany. 2010. 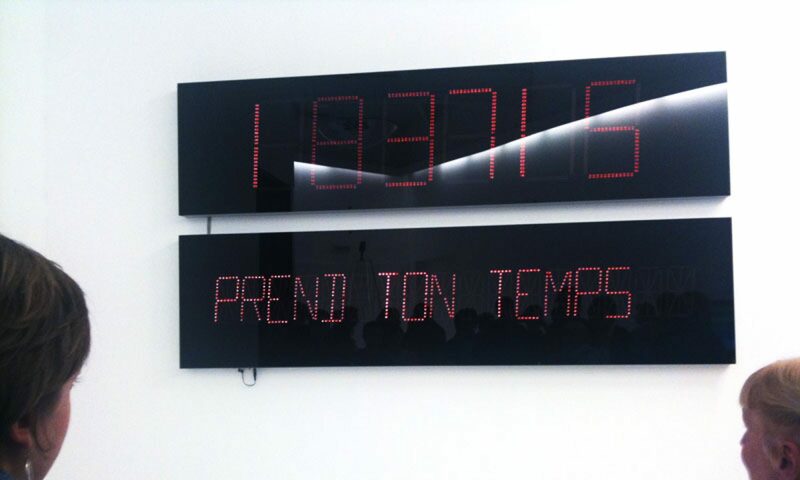 At the end of the day there is a time shift between the time given by the installation and the “official” time of Paris meridian. This shift is the expression of the “addition” of all emotional stresses left behind by the visitors of the installation. Whether positive or negative, it also expresse the average citizen’s battle against time — and thus, against others, since time takes is legitimacy from the will and consentment of every citizen to accept it as the “ruler” of modern life. 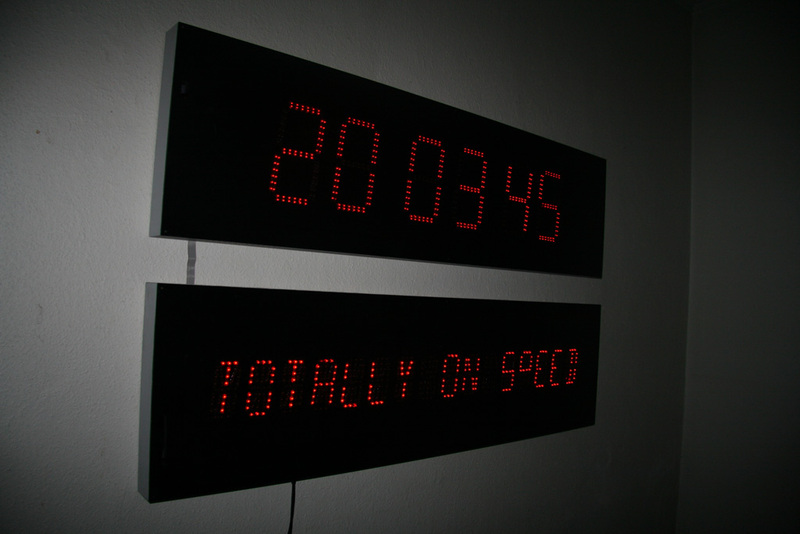 In addition to this, the clock-radio also displays contextual sentences like “Hurry up”, “Breathe!”, “Slow down” or “Time for a nap” (depending on the emotional state of the visitor). Here I imagined a new way of telling time, one that would directly convey time-related information at an emotional level instead of the usual “logical” way. There is a dazzling paradox here, inasmuch as we witness a world where more and more common rules and laws are governed by rigorous, science-supported processes, but the average citizen manage them at a more and more emotional level. 1st Ural Industrial Biennial, Ekaterinburg, Russia, 2010. LichtRouten festival, Ludenscheid, Germany. 2010. Rurart center for contemporary art, Poitiers, France. 2010. Louvre-Lens Museum, in the Pavillon de Verre, from october 2012 to october 2013.